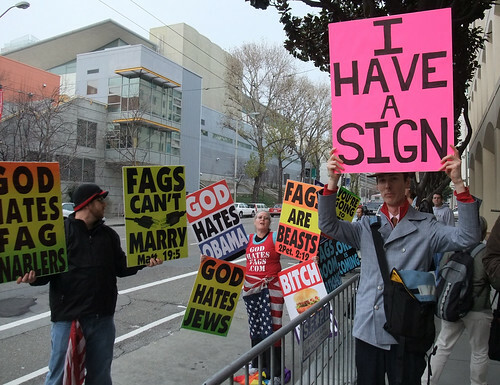 When the notorious Westboro Baptist Church traveled to San Francisco to protest outside of Twitter headquarters, some local pranksters showed up with ridiculously hilarious signs to counter them. I think Fred Phelps is simply the most epic troll alive. By taking the most absurd, extreme position possible, he is actually attempting to build support for the opposite position. Americans tend to think in very black-and-white terms. If they are offended at the phrase “God hates fags,” they will probably decide they side with gay rights. Wow, this gave me the serious shivers. People are a-one freakin’ nutso, i tell ya. The sign guy in Key West infuriates me. But that just lets him win by ruining my day. Have to grin though when I give him the middle finger. I slow down look at him smile start with a thumbs up then the bird comes flying out of control. Hate is not free speech in my opinion. 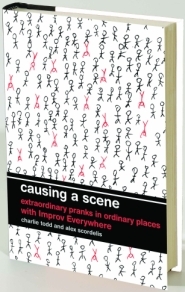 Urban Prankster covers pranks, hacks, participatory art, and other creative endeavors that take place in public places in cities across the world. It is edited by Charlie Todd. This blog was updated from 2008 to 2011. It was retired because in that time I realized I wasn't interested in being a blogger and that it was taking time away from my primary focus, creating.